WINTER '11. Stanford Engineering's European Entrepreneurship and Innovation Thought Leaders (ME421) is a weekly speaker series that presents industry leaders from Europe's hitech startup, venture finance, corporate and university research and technology commercialization communities to share their insights and experiences with aspiring and veteran entrepreneurs from Silicon Valley. From Ireland to Russia, and from Scandinavia to the Mediterranean, Europe's technology sector is today playing a growing role in bringing new energy, environmental, water, information, medical device and life sciences technologies to market thru small- and medium-sized enterprises. Europe's countries and regions, however, face substantial challenges in rapidly moving to the marketplace the technical innovations that are being developed in universities, national laboratories and corporations. Many of these regions are increasingly looking to Silicon Valley to accelerate this process and train a new generation of entrepreneurs and innovation professionals. We invite you to join us each week for a lively discussion of the challenges and opportunities facing European entrepreneurs, investors and innovation sector organizations. Our first Winter session will kick off with an indepth look at several new and established incubators aimed at European startups in cleantech, ICT and other sectors. Our goal here is to understand the different approaches used to source deal flow, underlying business models, and establish "soft landing" operations for European countries and regions in Silicon Valley. Aldo established M31 USA in 2010 and serves as its CEO. He co-founded M31 Italia in 2006, and became its General Manager in 2008. He currently serves in two portfolio companies: President and the CEO of Si14 (embedded PCs), and President of CenterVue (biomedical diagnostic systems). A true entrepreneur, Aldo founded and sold three successful startups over the course of his 30-year experience in the technology sector. All with corporate exits, the startups were in industrial automation and medical equipment. Aldo holds a Master of Sciences in Electronic Engineering from the University of Padova. Bjoern is a serial entrepreneur who has founded and led four for- and non-profit ventures in Germany, Bangladesh and the USA. Most recently he co-founded the new blackbox accelerator in the heart of Silicon Valley that focuses on helping high potential technology entrepreneurs from around the globe. During blackbox' three month program, entrepreneurs live in a co-working/co-living space in Atherton; afterwards blackbox assists each startup to develop business relationships between their home country and the Valley. Bjoern has also worked as an executive in Russia. Nicolai Wadstrom is a serial entrepreneur. He founded his first startup company in 1995, and has established and led a number of startups since then in industries ranging from enterprise software, computer games, internet, and media to professional services. Today Nicolai also serves as an Angel investor and advisor to Internet, Software, Mobile and Digital Media companies. Peter Laanen is responsible for the establishment and operation of the new Dutch government incubator 'Holland in the Valley' since early 2010 in collaboration with SDForum. The incubator is intended to guarantee incoming Dutch companies a 'soft landing' in Silicon Valley. Peter's industry experience has included the market repositioning of a major recording house, a highly successful initial public stock offering, and two corporate turnarounds. He has served as Managing Director of Arcade Music Co.; President and CEO of UltiFox Europe B.V. (a media- and soccer-related product firm); CEO of Top Sports Group B.V., President of Inter Football B.V., cofounder and CEO of Multi Function Computers B.V., (a Dutch minicomputer software firm). Clement Alteresco is an Entrepreneur and project designer working between Paris and San Francisco. Clement runs faberNovel's international development. Passionate about the future of work, he especially helps growing the pariSoma Innovation Loft, a co-working space & community that provides a technological hub between the US and France. Gioia Deucher joined swissnex San Francisco almost two years ago, and heads all activities related to entrepreneurship and innovation. She founded and directs a new incubation business model called "US Market Entry Camp". Previous to moving to the Bay Area, Gioia worked at UBS Research and Asset Management for socially responsible investing in Geneva and Zurich, and for the UN's microfinance program in the Palestinian territories. She holds an MA in International Relations from the University of Geneva and a Masters in International Finance from the Fletcher School at Tufts University. She is fluent in German, French, English, Spanish, and Portuguese. This second session features an indepth look at the state of venture capital and entrepreneurship in France, and French perspectives on the Valley scene. Our two speakers are respected leaders and pioneers from their respective sectors. The role of regions in European innovation and economic development is not well understood here in the United States. Our returning regional Government Partner OnlyLyon/Aderly will give a brief overview of the Lyon Region economy and innovation sector. Jean-Louis Gassée was named General Partner at Allegis Capital in April 2003. Prior to this, he headed up Be, Inc. which developed the Be operating system (Be OS) to provide multimedia software for appliances to deliver information, entertainment and interactivity over the Web; the company went public in 1999 and was sold to Palm in 2001. Mr. Gassée spent nine years at Apple Computer. In February 1981, he started Apple’s French subsidiary and, in 1982, was also named president of the “Apple Education” foundation. Mr. Gassée has served as a director of publicly traded companies such as Cray Computer Corporation, 3Com, Logitech and Electronics for Imaging, and was until late 2005 Chairman of PalmSource. He is a Board Director of Allegis Capital portfolio companies PureWave and QSecure. Loic is the CEO behind Seesmic. He founded the company in 2007, with the goal of turning online video into a powerful medium for threaded, interactive video conversations. A seasoned entrepreneur, Loic launched several companies prior to Seesmic including: shared web hosting company RapidSite, (acquired by France Telecom) and B2L, an interactive agency (acquired by BBDO). His last company, Ublog, was acquired by SixApart, after which Loic became Chairman of SixApart Europe. Loic also serves as a board member of Europe’s #1 dating site Meetic and Europe’s leading online bank Boursorama; acts as a venture partner for Wellington Partners; and helps bolster innovation and entrepreneurship in Europe through his conference LeWeb, Europe’s leading web conference for businesses and web 2.0 innovators. Our third session presents Europe's two leading SuperAngel investors here in Silicon Valley. We are also pleased to welcome our first speaker from Turkey at this class. Aydin Senkut is the Founder and President of Felicis Ventures. He has been recently named one of the top 25 tech angels by Business Week. An angel investor in promising start-ups since 2006, his portfolio encompasses over 50 companies including Aardvark (acquired by Google), Mint (acquired by Intuit), Powerset (acquired by Microsoft), and Tapulous (acquired by Disney). Prior to starting Felicis Ventures, Aydin joined Google in 1999 as its first Product Manager to launch its first 10 international sites. He then became the first International Sales Manager at Google, responsible for world-wide licensing deals. Before joining Google, Aydin was a Product Manager at SGI. Jean-Francois “Jeff” Clavier is the Founder and Managing Partner of SoftTech VC, one of the most active seed stage investors in Web 2.0 startups. Since 2004, Jeff has invested in more than 80 consumer Internet companies in areas like social media, monetization, search, gaming or B2B/B2C web services. These investments are typically located in Silicon Valley, New-York and Boulder. In 2007, Jeff was recognized as one of the 13 “Web 2.0 King Makers” by Business 2.0. BusinessWeek named him one of "The 25 Most Influential People on the Web" in 2008, and one of the "Top 25 Angels in Tech" in 2010. In Session Four, we deepen our focus on emerging cleantech and Internet software startup companies out of Europe. The lecture will feature our first speaker from Greece. Vassilis Nikolopoulos is the CEO and Founder of Intelen, one of the most dynamic and emerging Greek start-ups in the domain of smart grid applications and energy information systems. He has seven years experience in big multinational companies as an IT consultant, Chief Innovation Officer and Innovative Business Development manager. In 2010, Guidewire Group (USA) short-listed Intelen as one of the Innovate100 contest finalists for the top-100 innovative start-ups worldwide and Intelen services were proposed as candidate best practices in Eco Innovation OECD-EU 2010. In 2010, the US VC magazine Red Herring voted Intelen as one of the top-100 most innovative companies in the world. Juha is a serial entrepreneur with an impressive track record in both Europe and the U.S. Currently, he is CEO of Cloudmade, a startup that is pioneering the use of location to enable developers and OEMs to create compelling location enabled products. Juha is also Chairman of Cogniance, a pioneer in the rapidly growing outsourced software development market. In addition Juha is a board member at Teleca, the world’s largest mobile software services company, and a founding Venture Partner at Sunstone Capital. Juha led the initiative that brought Nokia, Motorola, Ericsson and others together to create the operating system company Symbian. Later he ran Microsoft’s mobile platform efforts, bringing to market Pocket PC and Smartphone. For this fifth session, we shift our gaze to AI and open source software startups. The lecture will feature short a overview by our returning Government Partner Innovation Norway regarding the Norwegian technology and innovation sector, and a very impressive entrepreneur from Spain's Basque Region. A powerhouse of tireless can-do enthusiasm, Lasse brings a unique blend of business, technical and people skills to leading Forgerock. His twenty-plus years of experience in the software industry include leadership roles at both Sun Microsystems and Texas Instruments, most recently as CTO for Sun Central and Northern Europe. His passion and vision combine to ensure ForgeRock is always ready to execute and deliver. From 2000-2003, Lasse served as Co-Founder and CTO of www.gravityrock.com. His special skills span being an entrepreneur, "the network is the computer" (cloud computing), identity and access management, web 2.0, infrastructure software, open source, distributed organizations, and leadership. Xabier Uribe-Etxebarria is CEO and Founder of Anboto company. Anboto is the company leader in Semantic and Natural Language technology applied to Web Customer Service and eCommerce. The products of Anboto are: Virtual Sales Agents and Intelligent Chats; their system been named the best dialogue technology by Gartner. Anboto has also been awarded the Start-up of the Year 2010 distinction world wide by Guidewire Group innovate!100 ranking. Xabier comes to Stanford via our 2010 partner Innobasque - the Basque Innovation Agency. Session Six shifts our attention to the university technology transfer, commercialization and spinout ventures scene, with two examples from leading universities in the Czech Republic and Italy. We examine how different European countries approach this complex legal, administrative and management challenge vital to successful research-based innovation. Finland's Aalto Entrepreneurship Society, Europe's leading student entrepreneurship association at a university, is presented as a riveting example of the pivotal role that student groups can play in developing national innovation ecosystems. Dr. Ruggero Frezza is a recent Professor in the Department of Information Engineering at the University of Padova, Italy. He also serves as President and CEO of M31 Italia, a private incubator based in Padova. Ruggero has founded with his students and collaborators six companies including: Biovision (now incorporated in Microtec), eMotion (now incorporated in BTS), VI-grade and M31. Each of these companies operates in the high tech sector, ranging from the biomedical industry to wood processing and CAE instruments for automotive enterprises. Ruggero completed his Ph.D. and M.S. in Electrical Engineering at the University of California, Davis. Vladimir Marik was appointed a professor of Control Engineering at the Czech Technical University (CTU), Prague, in 1990. Later, he founded the Department of Cybernetics which has been recognized as an EU Center of Excellence. Dr. Marik acts as the Head of this Department which belongs to the strongest research department in the country. This Department has long-term contract cooperation with Toyota, Volkswagen, Medtronic, Google, and Honeywell as well as with the FAA and US defense services. 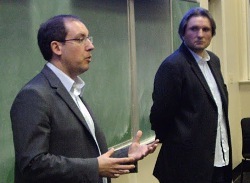 Since 2010 Vladimir acts as Managing Director of CertiCon, a.s., a large technology transfer company spun off from CTU. Our seventh session this Winter Quarter will examine the state of venture capital and entrepreneurship in Estonia and Romania. Rain Rannu - CEO & Co-Founder, Fortumo Ltd. Rain Rannu is co-founder of Fortumo, and is responsible for the company’s strategy and new business development. Rain has been involved in the mobile industry for 10 years. Prior to founding Fortumo, he was also the founder and head of business development for the leading Baltic mobile service provider Mobi Solutions. Rain has also worked in several innovative enterprises in the fields of sales, web development and project consulting. Rain has an MBA degree in Entrepreneurship and Technology Management from the University of Tartu. He lectures frequently at the E-Governance Academy and speaks at industry events like Mobile World Congress. Since 2010, Rain is one of the founding organizers of Garage48 startup bootcamps. Irina Anghel is Secretary General of the South Eastern European Private Equity and Venture Capital Association (SEEPEA), and sits in the Representative Group of the European Venture Capital Association. Lawyer and Law Professor, Irina founded 10 years ago the first Romanian law firm dedicated to advising funds and entrepreneurs for their VC transactions and during the past years she became an active supporter of entrepreneurship in South Eastern Europe. In 2008 she was one of the 4 Global Ambassadors of the Global Entrepreneurship Week, covering 77 countries. Irina also has an academic career teaching civil law in Bucharest and a special course, that she developed herself, specifically aimed at Romanian MBA students. Our final Winter Quarter session will investigate a vital issue for the European innovation system - University Reform - with Germany as a specific example. This topic is generally neglected in discussions of national and EU innovation policy in European capitals and Brussels. The teaching team will also give a summary overview of the European innovation ecosystem and entrepreneurship landscape based upon the major themes touched upon by our many speakers during the quarter. Gerhard Casper is President Emeritus of Stanford University. He is also the Peter and Helen Bing Professor, Emeritus, and a Senior Fellow at the Freeman Spogli Institute for International Studies at Stanford. Mr. Casper studied law at the Universities of Freiburg and Hamburg, where, in 1961, he earned his first law degree. He went to Yale Law School in 1961, obtaining his Master of Law degree a year later. He then returned to Freiburg, where he received his Doctorate in 1964. That same year, Mr. Casper emigrated to the United States, spending two years as Assistant Professor of Political Science at the University of California at Berkeley. In 1966, he joined the faculty of the University of Chicago Law School (and, one year later, also the Political Science Department). Between 1979 and 1987, he served as Dean of the Law School. In 1989, Mr. Casper became Provost of the University of Chicago, a post he held until he accepted the presidency of Stanford University in 1992. He has written and taught primarily in the fields of constitutional law, constitutional history, comparative law, and jurisprudence. Please visit his Stanford website for additional information on Professor Casper's current projects. Dr. Burton Lee PhD MBA directs Stanford Mechanical Engineering's European Entrepreneurship and Thought Leaders speaker series. His professional credentials span over 15 years of innovation sector entrepreneurial, senior executive leadership and advisory positions with venture-backed startups, global technology corporations, venture capital and private equity firms, angel investor groups, federal S&T agencies, state economic development offices, leading research universities and foreign governments. Burton's management and technical experience includes senior executive and research positions with Hewlett Packard, GE Global Research, DaimlerChrysler AG and NASA in the United States, Europe and Japan.